"HIS LIFE INFORMED US, HIS DREAMS SUSTAIN US"
This collection of Dr. King's writings includes all the major speeches -- such as I Have A Dream and I See the Promised Land, as well as important writings such as Letter from A Birmingham Jail. 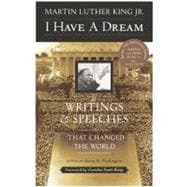 It also has great essays on the lessons Dr. King learned from Ghandi and a wonderful introduction from Mrs. King. This is a great collection to get started learning about Dr. King -- from his own pen. I highly recommend it. I Have a Dream: 5 out of 5 stars based on 1 user reviews.